The Body Mass Index ( Weight divided by height square) is a general tool to determine your healthy weight. You have to take into consideration the age, level of activity, quantity of body fat, quantity of muscle. For bodybuilders an very fit people, the BMI can be in the high number, even overweight which is good for them because they have more muscle. Because each person is different and we all have different sizes and shapes there is not only one test that will determine the ideal weight. Despite its limitations, BMI is still used to compare different groups of people and if it is abnormal it has been linked to different kind of health problems. It was developed in 1800 to link body weight and cardiovascular disease. You can check your BMI in this calculator from the U.S. Department of Health and Human Services. 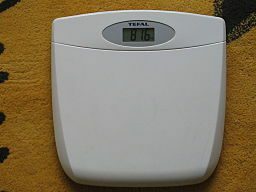 The Body Fat Percentage is another indicator to know if a person has an ideal body weight. It takes into consideration measurements of body fat in specific areas like the abdomen, biceps, tights etc. and this test is more accurate but not perfect either. The Waist to Hip Ratio is other indicator that helps determine the ideal weight. The Waist to Height Ratio ( Waist to Stature Ratio). It is another ratio that can help to define if we have a healthy weight. There are other indicators, some of them need sophisticated equipment and used by nutritionists, medical doctors and fitness experts. How healthy you feel with your weight has to come into consideration when you want to determine your Ideal weight.